Would you like to know what keywords your competitors are ranking for? Would you like a report on where you are ranking for your top keywords and if they are going up or down? Would you like to get an idea of how your traffic compares with your competitor? SEMRush provides this functionality and a lot more! It’s such a useful tool so I want to share with you what is possible. Note: For the purposes of this review we used the paid tool. You can go to the SEMRush website and start using SEMRush free trial. There are some limitations but it’s still useful. What is the purpose of SEMRush? 7. Find advertising opportunities before your competitors do! So let’s start with answering the basic question – what is SEMRush? SEMrush is a website analysis tool that can help you analyze and optimize your SEO strategy. If you want more traffic you need to understand more about the keywords you or your competitor rank for (or don’t rank for), links, etc. The best way of explaining SEMRush is going through some key pieces of functionality that’s available in the platform. You can try it out here or read the article first!! Traffic – The estimated traffic for a particular region your site gets for the top performing keywords on your site. This is not all the traffic but it’s an estimate of the top performing keywords based on where they are in search results. This is really useful when you want to do a comparison of traffic for you and you competitors. You can download the report produced by SEMrush as a pdf and also change the date ranges so that you can see progress over the last year or two. 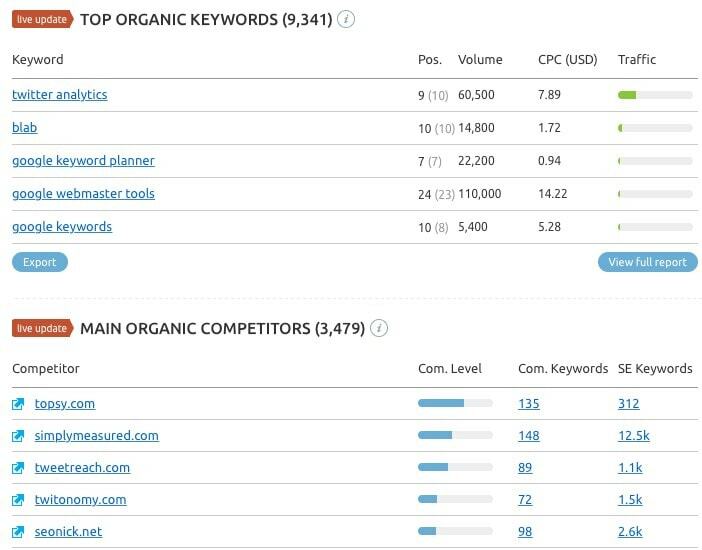 The following two images shows the keywords a site is ranking for and also the main organic competitors. The reason these are listed as competitors because the sites are ranking for a lot of similar keywords. It’s awesome knowing who you are competing against. If they are above you in search results for any particular search term you can analyze their content and links to see if you can optimize your content for better rankings. Monitor your dashboard on a weekly basis to keep an eye on your progress. When you see your rankings drop (and not recover) this might be a time to optimize it. From the first SEMRush screen, enter your competitor’s name and select their location. In this SEMrush review we are focusing in on a social media news site called Social Media Today and we have specified that we’re interested in their US search results. 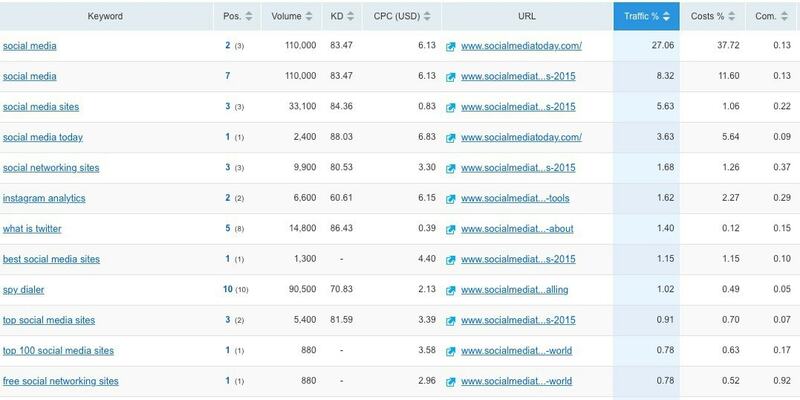 Keywords: The top keywords that Social Media Today are ranking for. Position: Where they are ranked for these keywords (the number in brackets is their ranking the last time SEMRush evaluated search results). Volume: The estimated monthly traffic that is generated from these keywords (i.e. how many times people search for them). KD: The keyword difficulty. This shows how difficult it is to rank for those keywords. The higher this number the harder it is to rank for these keywords. CPC: The average price of a click if someone advertised based on this keyword (in US Dollars). Traffic: The average percentage of all traffic the website is getting from this keyword. CD: How competitive this in Google for advertising. 1 means the highest competition. I know you’re thinking that this is great, but what do we do?! If a competitor ranks for keywords that are relevant to your business, why don’t you try to get that traffic instead? Note: You also need to understand your domain authority. A domain authority is a number out of 100 and the higher this number is the easier it is to rank for content. If your domain authority is higher than your competitors then there’s a better chance of taking some of their traffic! a). If your competitor is ranked higher but the post is not keyword-optimized, write an article focused on those keywords if the keyword difficulty is not too high. b). Find competitors (or similar companies) that have a lower domain authority and research them using SEMrush.com. It will be much easier to write content that will rank higher. c). If their domain is much higher and the page rank is high (each page is also ranked) then ignore it and move on! Maybe you just want to enter in keywords and find out if it’s going to be difficult to rank for those keywords or not? SEMRush make this very easy. Enter the keywords and find out the number together with the estimated volume of searches on a monthly basis and number of results. 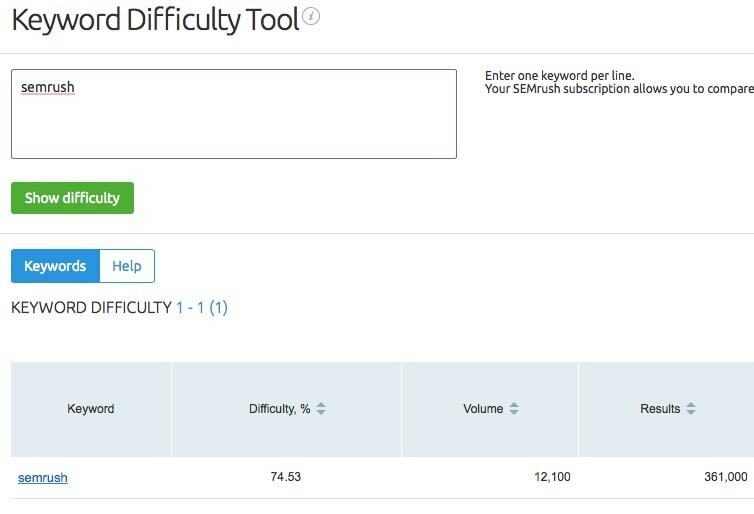 Enter the keywords and find the difficulty! Use this tool to analyze every keywords that you are trying to target! What about the competitors of your competitor? SEMrush does an analysis to find other companies that are ranking for very similar keywords, which it then ranks in a list. Based on this list you can see an estimate of the amount of traffic these companies get from their top keywords so you can get a good idea of their traffic levels. The traffic is always estimated but it can be useful if you want to compare A with B. For example, if competitor A has 60k of traffic and B has 20k, you know that A has roughly 3 times the volume of traffic. Common keywords: The keywords in common with the site we are analyzing that are ranked in the top 20 search results. Pick out the competitors you think are really relevant and do a full analysis on their competitors. You’re looking for the same again i.e. keywords that get traffic that you could rank on. 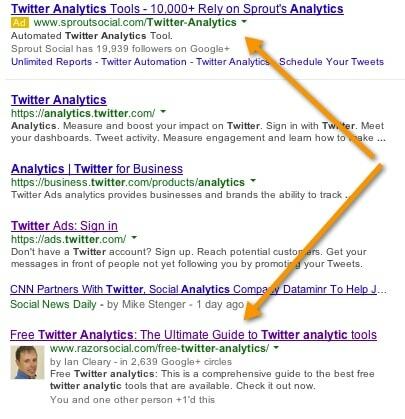 It’s important to keep an eye on where you are ranking in search results for keywords. Are these rankings going up or down? Can you optimize your content for rankings that are going down? SEMRush allows you input a range of keywords or automatically load up keywords detected by SEMrush you rank for. You can then track these on a weekly basis. Set up SEMRush to monitor your top 100 keywords. Sort this by most traffic and keep an eye on keywords that are loosing ranking. Also, look at keywords that are ranking outside of the top 10 and use suggestions provided by SEMRush to optimize the content. The keywords just outside the top 10 are the low hanging fruit keywords i.e. the easier ones to pick off and improve ranking. 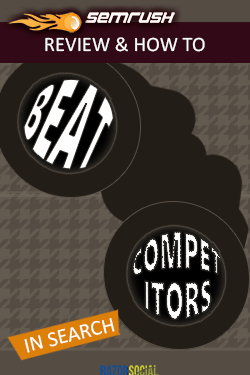 … they also give you suggestions on how to improve the ranking. For example, SEMRush will analyze other competitors that are ranking for similar content and find words related to the keywords you are targeting that are not in your content. If they make sense then add these to your content to help with ranking. Analyze all your content and implement the most relevant suggestions! There are websites paying for traffic, through Google AdWords, while you are driving your own traffic for free. AdWords can be quite expensive, so if you were able to find these companies you could make money by suggesting they put their ads on your site directly. In our SEMrush review we can show you that the tool makes this easy. It looks at all the keywords you are ranking for and then identifies companies that are advertising based on these keywords and displays them in a chart. Common keywords: These are keywords they are bidding on that you happen to rank for. Ads keywords: The keywords they are targeting. This is a list of some of the keywords that RazorSocial ranks in the top 20. They are also targeted by Sprout Social when they pay Google for AdWords Ads. The first one I highlighted is for Twitter analytics. If you look at the image below you’ll see the ad run by Sprout Social and my organic search result. If you look further down the list and see ‘free twitter analytics’, we are ranked number 1 for this term and SproutSocial are advertising. SEMrush is a great way of sourcing opportunities and partnerships with companies that are spending money on keywords that you rank for. Search out some relevant companies and approach them to see if they want to put ads on your site. This can be especially successful if you find that they are spending a lot of money advertising for keywords you already rank for. Because they are shelling out on Google ads, you are in a great position to negotiate good rates! You can see how valuable SEMrush can be for analyzing your performance and that of your competitors. We use this tool on a regular basis and you should consider it too. The free version does provide some useful analytics to start with. If you find you are benefiting from what it has to offer, you might want to go ahead and get the paid version. SEMRush have provided us with an exclusive 1 month free trial for Guru which is $149.95 per month, click on this link to avail of it. Here are some potential actions after reading this SEMRush review. 1. 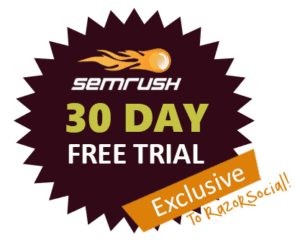 Try out SEMRush initially on a trial for free. 2. Put a comment in the box below and tell us what you think of the post. 3. Share the SEMrush review post with all your friends. 4. None of the above – do something that I haven’t thought of yet! Do you know of a good SEMRush alternative?